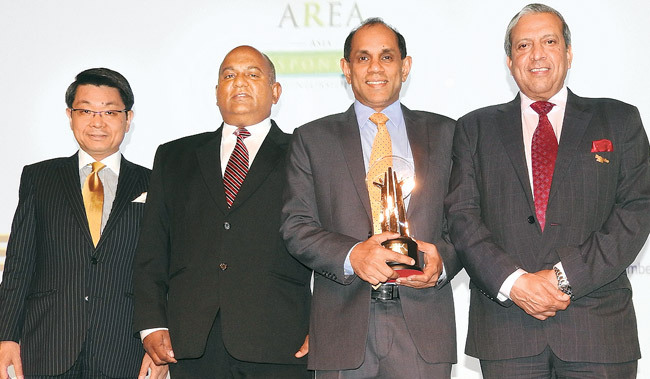 For the second consecutive year, Ceylon Tobacco Company PLC's (CTC) flagship Corporate Social Responsibility programme, Sustainable Agriculture Development Programme (SADP) received the Asia Responsible Entrepreneurship Award from Enterprise Asia for its unprecedented impacton rural poverty empowerment. The award was bestowed at the recently concluded ceremony held in Singapore. Over the years, SADP has developed into one of the largest private-sector CSR initiatives across Sri Lanka and today it celebrates a decade of rural empowerment. In the past 10 years, SADP has aided over 71,000 beneficiaries in over 18,000 families in 16 districts across the country. "We are honoured to receive this award for the second year in a row. It comes at a time when we are also celebrating the successful 10 years of SADP which adds to the programmes achievements since its inception in empowering rural communities. We are certain that SADP will continue to grow in the years to come and carry on in its quest to empower underprivileged communities," said CTC's Chief Executive Officer and Managing Director, Michael Koest. SADP works on the philosophy of 'helping those who help themselves', while promoting sustainable agriculture that has in turn created a paradigm shift in the attitude among rural communities across the island. The programme empowers families with agriculture knowledge and resources such as seeds, plants, poultry, bee keeping, mushroom cultivation and Goat raring that focus on creating a long-term engagement between the beneficiaries and their path towards self-sustenance. Enterprise Asia organises the annual award show to honour companies across Asia for demonstrating leadership, sincerity and on-going commitment in incorporating responsible and ethical values, legal compliance, respect for people and individuals, involvement in communities and protection of the environment into their businesses activities.